4th & 5th Graders Ski Free in PA with the PSAA Snowpass Program! This now 4th-grader is excited for her Snowpass! Do you have a child in 4th or 5th grade who loves to ski, is eager to learn, or just enjoys trying new adventures? If you’ve answered yes, then do not miss — I repeat, Do. Not. Miss. — the chance to sign up for a Snowpass from the Pennsylvania Ski Areas Association (PSAA). This wonderful program was created to introduce kids to skiing and snowboarding at an age that is great for learning a new sport. It also encourages families to spend time together in a fun and active way during the winter months. 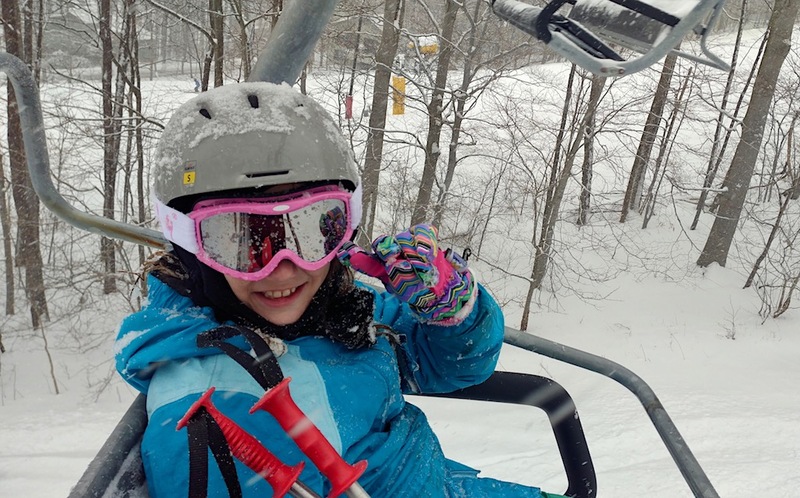 With the Snowpass, kids get a one-time Learn to Ski/Snowboard Package (beginner lesson, equipment rental, and one-day lift ticket), plus three one-day lift tickets for each participating Pennsylvania resort — and there are 23 of them this year. The pass can be used anytime during the 2018-19 ski season, except for a few black out dates between Christmas and New Year’s, MLK weekend, and President’s Day weekend. Kids must be accompanied by a paying adult (and no more than two kids per adult). We got the Snowpass for Owen when he was in 4th and 5th grade and made great use of it both seasons. (He’s the best skier in our family!) Now that Sasha is in 4th grade, we’ll be taking advantage of this fantastic opportunity once again. A couple of things to note: 1) There is a $35 fee to sign up your child for the Snowpass. 2) Equipment rentals are only included with the Learn to Ski package; you need to bring or rent your own gear with the one-day lift tickets. Besides that, it’s free for Snowpass holders to ski and snowboard all season! For more about the Snowpass Program, including participating resorts and all the rules and restrictions, visit the SkiPA website.